Dean Hammond is confident Brighton can reach the Championship play-offs. The Seagulls currently lie four points off Middlesbrough in sixth following their 1-1 draw with Blackburn Rovers. 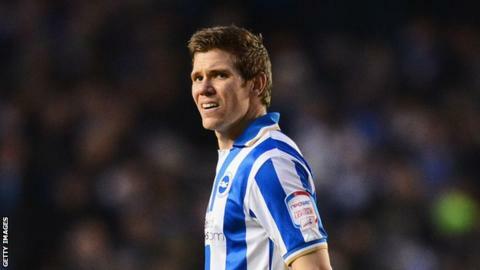 The midfielder told BBC Sussex: "There is a lot of experience within the squad. We are still confident we can achieve what we want to do. "Everybody is chomping at the bit to achieve something at this club. We are really focused on what we want to do, so we will continue what we are doing." The 29-year-old continued: "There's 15 games left, we have a target and we have to take one game at a time. "If we can perform like we did against Blackburn, especially how we did in the first 20 minutes, we can definitely achieve what we want to." The Sussex club were largely frustrated against Rovers at the Amex Stadium on Tuesday. Albion could not find the net despite their first-half dominance and then fell behind when Scott Dann headed home from a corner. Former Spain international Vicente equalised from the penalty spot in the second half but Brighton were unable to find a winner. "We played really well and we are disappointed we didn't come away with the three points," Hammond added. "We were well on top, had chances and then they got ahead from a set piece. "We got back into the game and showed our strong mentality. "We've had two home games [against Hull and Blackburn] and got four points out of six. "We could have had six and that's where the frustration is, but it is another game unbeaten and we move on." The Seagulls return to action next Tuesday when they travel to league leaders Cardiff City.